Keywords: Address quality, Data quality, Addresses, Address database, CRM, Duplicates, Duplicate check, De-duplication, Consolidation, Software. It is easily overlooked that it is not sufficient to only find duplicates. They must be cleansed as well. Selection is the conventional procedure: An address is selected which will survive and the remaining addresses will be cleansed. Although through selection certain priorities may be defined, i.e. addresses from a specific file or the address with the latest date of change are preferred. The problem that information from cleansed addresses eliminated addresses is lost remains. Even in case of simple applications, like preparing a mailing, Selection gives unsatisfactory results. If there are two duplicates, one with the title and the other with the first name (for e.g. “Osborn, PhD” and “Joe Osborn”), then while selecting, either “Osborn, PhD” or “Joe Osborn” can exist. The desired completion “Joe Osborn, PhD” can only be accomplished by Consolidation. Hence it is recommended to initiate a consolidation also in case of such simple tasks like de-duplication for mailing. Image 1 – Rule of consolidation for first name: The instruction is to be read from right to left. Initially all the available names are selected (non-empty). 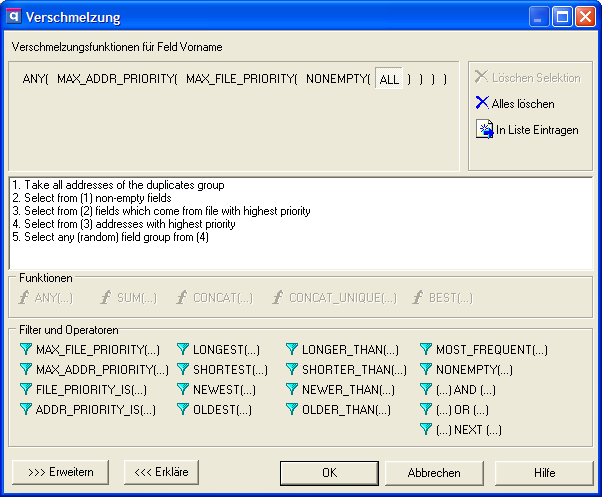 Then that name is selected which belongs to the file with highest priority (maxfileprio). Under the remaining names the name with the latest date of change is selected (maxaddressprio). Image 2 – Rule of consolidation for telephone number: All the existing, unique telephone numbers are selected (non-empty) and concatenated. The numbers are separated by a semi-colon (concatunique). Observe the numerous possible consolidation functions in Images 1 and 2!